Full-color screen, progressive sound control and the latest multi-frequency technology for improved visualization of the file progression. Easy to read full-color screen that shows an image of the tooth as well as a numerical value to indicate the file progression in the tooth. Emits audible information using progressive sound control. The device beeps faster as it approaches the apex and once the apex is reached, emits a solid tone. Fully automated and requires no calibration before use. Powered by a rechargeable, low-volt nickel-metal hydride (NiMH) battery, the Detect Apex Locator eliminates the need for frequent battery replacement and provides a nonstop operating time of about 6.5 hours on a full charge. With a compact, smart design, Detect fits comfortably in the hand to provide a steady hold during root canal procedures. Detect is an innovative apex locator featuring a full-color screen, progressive sound control and the latest multi-frequency technology for improved visualization of the file progression. Supported by extensive research and testing, Detect will allow practitioners to sharpen root canal visibility and accurately measure root canal length during endodontic therapy. Detect features an easy to read full-color screen that shows an image of the tooth as well as a numerical value to indicate the file progression in the tooth. In addition to the large visual display, Detect emits audible information using progressive sound control. The device beeps faster as it approaches the apex and once the apex is reached, emits a solid tone. 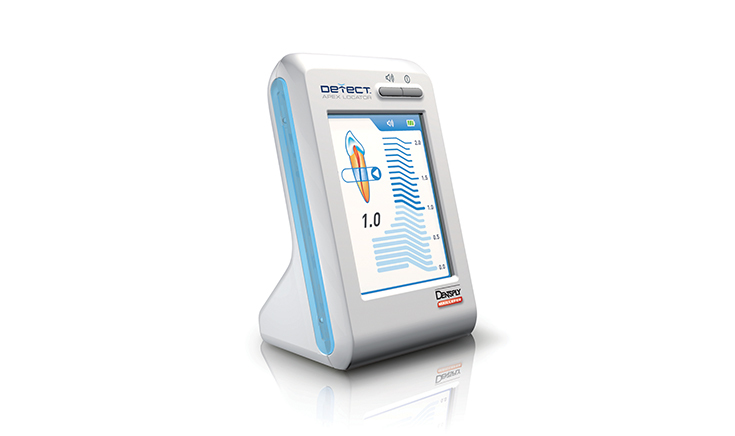 Detect is fully automated and requires no calibration before use. Powered by a rechargeable, low-volt nickel-metal hydride (NiMH) battery, the Detect Apex Locator eliminates the need for frequent battery replacement and provides a nonstop operating time of about 6.5 hours on a full charge. With a compact, smart design, Detect stores away easily and fits comfortably in the hand to provide a steady hold during root canal procedures.